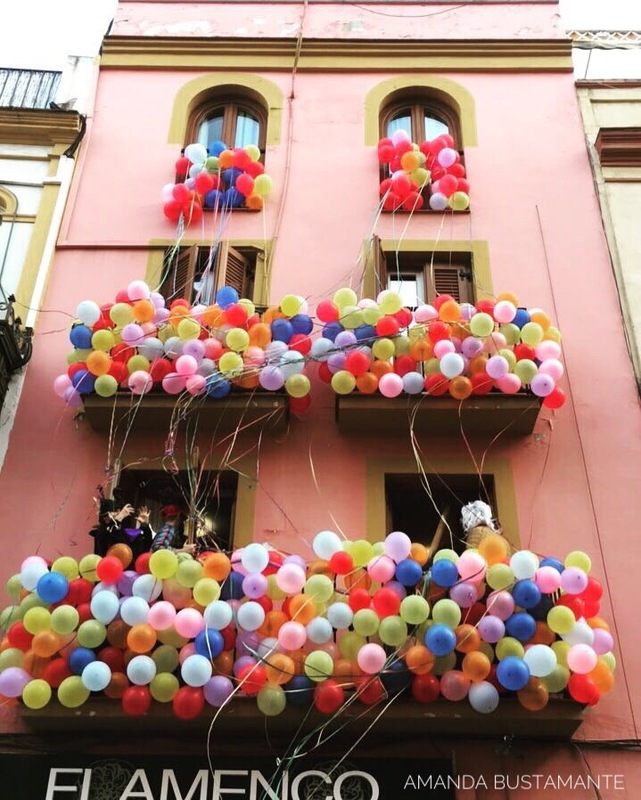 Balcony of Balloons. This photo was taken today during my walk to Alameda De Hercules. Today is January 5th which marks “Dia de Los Reyes Magos” or “The Day of The Three Kings”. I have been living in Sevilla, Spain for the last two years. Anyone who has spent time in this city will tell you that it is arguably the happiest place on Earth. I would have to agree. Here is what Sevilla has taught me on becoming a happier person. 1) Socialize more. And do it with more than just friends and family. In the U.S, we keep our work life and social life pretty separate. Other than end of the year Christmas parties, coworkers never really seem to get together. Here in Spain it is not uncommon for your workmates or even your boss to invite you out for drinks and tapas after work. 2) Take Time Off. The south gets a bad rep for being “sleepy” or “lazy” but I like the term “well rested”. In the south, people usually don’t overcommit or set expectations higher than what is realistic at the moment. If they’re sick, they call in. If it’s 100F+ outside, they close up shop for the peak hours of sunlight. This in return saves individuals ample amount of time and energy by avoiding overcommiting and exhausting themselves. 3) Make Time For People. This could also fall under the “socialize more” tab but I wanted to give this topic a tab all its own. In English we use the term “to spend time” with people as if our time is a limited resource. In Spanish they say to “pasar” or “to pass” the time with someone. As if time is unlimited. I try and view my one-on-one time now as a moment to pass with another individual rather than “to spend.” “To spend” feels like there is an obligation of meeting. “To pass” sounds more natural and enjoyable. 4) Make a Joke About It. You drop your silverware on the ground? You make joke about it. You mess up a subjunctive phrase in Spanish? You make a joke about it. You’re unsure of what’s going on? You make a joke about it. Laughter heals all wounds and people from Andalucía are the best caretakers. They can make you laugh at anything. A very charming characteristic may I add. 5) Sing and Dance When You Feel Like It. I literally mean WHENEVER and WHEREVER. At the bars, especially during the holidays, you will hear at least one Sevillano man burst into song while clapping his hands to a flamenco beat. I have many times have also seen children and teenagers dancing Sevillano on the school grounds. There is no shame. Everyone can sing and dance as they please. 6) Sit Down For Meals. One thing I love about Sevilla and Europe, in general, is that everyone makes an effort to sit down and share meals together. For most Americans, living in a high-speed culture, this is a custom that is slowly dying out. I hope within the next few years we see a change because there is something so human about coming together to enjoy a meal. Everyone is in a good mood because there is food and now we have the opportunity to enjoy one another through conversation. 7) Family first. Last but not least, one of the best life lessons Spain has left me with is the importance of family. One thing I loved about working at an elementary school was seeing the grandparents come by to pick up their grandkids after school. Growing up, my grandparents lived 8 hours away so I never dreamed of them picking me up. Watching the grandparents and students interact at the school, I knew it was a nice moment for the both of them. When we are children we are most like our families. We grow into teenagers and then start to believe we are most like our peers. Maybe this is true, for that moment, but studies show that once we reach our twenties/early adulthood we go back to being most like our parents. Why? To me it makes sense. Our family members are the people we spend the most valuable time with during our developmental years. We also share similar DNA coding and behavioral patterns. These are the people we value most because they hold a secure place for us. One that could never be replaced. I love all these, especially about spending more quality time with people, away from distractions !!! Very well done. I completely agree. Thank you for the kind words of encouragement, Paul !